Summary: Writing at the height of her narrative and imaginative gifts, Sue Monk Kidd presents a masterpiece of hope, daring, the quest for freedom, and the desire to have a voice in the world—and it is now the newest Oprah’s Book Club 2.0 selection. 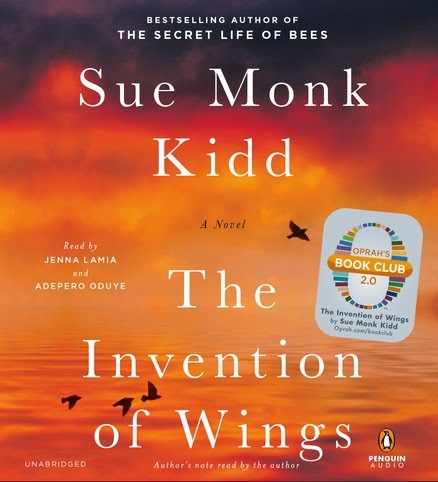 I actually listened to THE INVENTION OF WINGS by Sue Monk Kidd some time ago and forgot to write a review. And that's a shame because I loved this novel. Initially, I kept procrastinating because I didn't know if I could write a review that expressed my thoughts and feelings, and then, as time passed, I truly forgot. Fortunately, I had a bit of a reminder yesterday when I was offered the chance to giveaway a copy of the book! THE INVENTION OF WINGS tells the story of two very different women -- Handful, a slave in early 19th century Charleston for the Grimke family, and Sarah Grimke, a young woman who aspires to be a lawyer. The novel begins when Sarah is eleven years old and she's given Handful for her handmaid. Sarah doesn't feel right about "owning" Handful, yet they develop an unusual relationship. The book follows these girls over the next five years as they grown into women. Handful definitely faces some difficult times, as does Sarah; and eventually, Sarah leaves Charleston to work with her sister Angelina for abolition and women's rights. I know my summary didn't do justice for the complexities of THE INVENTION OF WINGS; however, I wanted to tempt you without giving away too much. So much of this book was touching and also extremely interesting. In fact, this novel is actually based on real-life figures Sarah and Angelina Grimke, two pioneers for slaves' and women's rights. I had never heard of either of them, but evidently, they were quite notorious in their time. Handful, on the other hand, is a character created by the author. The story is told in alternating points of view by both Sarah and Handful, and I loved this format. It was wonderful getting insight into both of their stories and I truly think the novel benefitted from this. Personally, I found Sarah's story to be fascinating on a historical level -- I enjoyed seeing how she became an abolitionist and women's rights advocate. However, I enjoyed the "feel" of Handful's story even more. Her saga was so difficult and troubling, but I thought her character came to life beautifully. There were so many great things about this novel, but I think what I liked the most was Ms. Kidd's writing style. It's no surprise that I loved THE SECRET LIFE OF BEES like many of you, however, this book was equally compelling to me. I found THE INVENTION OF WINGS to be incredibly well written from the character development, to the exploration of relationships, to the historical aspects. There is no doubt that Ms. Kidd did some major research prior to writing this story. Another thing that really stood out to me was how the theme of freedom rang through the novel. Of course, Handful wanted her freedom as a slave, but Sarah was also "bound" by society at this time. She realized she was put on this earth for big things, but she was constrained by being a woman. In addition, the author included some beautiful symbols into the story like birds, flying, and a special quilt. It was all so well done! THE INVENTION OF WINGS is read by Jenna Lamia and Adepero Oduye, and I thought they did an outstanding job. I just love when there are multiple narrators of a novel and the audio version reflects it with different readers. I am far from an expert of accents, but I did feel as if theirs were pretty good. In addition, I really enjoyed the emotions they were able to portray. I think this novel is a perfect selection for book clubs. The publisher has put together a fantastic book club kit which includes a reading guide and a conversation with the author. There are seventeen discussion questions and I'm confident your group will find even more to discuss. Some of the topics that you might want to explore include sister relationships, parent/child relationships, slavery, the role of women, faith, racism, and freedom. In addition, you will want to discuss the imagery of birds and flying. I adored THE INVENTION OF WINGS and highly recommend it for fans of historical fiction. Giveaway alert: I have a copy of THE INVENTION OF WINGS (not audio!) to share with one very lucky reader courtesy of the publisher. To enter, just fill out the form below before December 3rd at 11:59 p.m. EST. I will randomly select and notify the winner the following day. This contest is open to those of you with U.S. and Canada addresses only. Good luck! I agree this would be perfect for book clubs. You know I don't usually like historical fiction and I loved this book! I want to read this one! I loved Sue Monk Kidd's Secret Life Of Bees. I read this, too. I didn't care for it as much as you did and gave it only three out of five stars. In spite of all the wonderful reviews of THE INVENTION OF WINGS, for me, it got off to a bad start. If you prefer books that grab you and won't let go, this didn't seem to be it. But I agree that this really is a good book, just not quickly enough. This was a super audio, wasn't it?